I recently interviewed Eric Albrecht (a.k.a. Blakbird) for Hispabrick Magazine. We talked about a number of things and I'd like to share part of the interview with you here on TBs . You can read the rest of the interview in Hispabrick Magazine 008. Jetro: How did the idea of creating Technicopedia come about? Jetro: How many Technic sets do you own? Eric: The short answer is "all of them". product than Technic and I no longer have any of those. I also don't consider Mindstorms to be Technic even though it uses Technic pieces. These are my own decisions and other people no doubt have different opinions. Jetro: Which one was most difficult to get? Eric: There were several times during my collecting when there was a "Holy Grail" that I just couldn't find and focused all of my energy. In the early days I did not know about Bricklink (or it didn't exist yet) and I was doing all my searching on eBay. I remember that I had an active search open for the 8862 Backhoe loader for 6 months before I was able to find a copy that was almost complete. Even then it was missing one of the big rear wheels (24x43). It turns out that particular part only exists in yellow in this one set so I thought I had no hope of replacing it. It sat on my shelf with no rear wheel for over 2 years until I found Bricklink. I now have 2 copies of this set but still don't have a box. The 858 Auto Engines were also extremely difficult to find, even on Bricklink. This set cost more money per part than any other set I have even though none of the parts are very unusual. Jetro: Asking you for your all-time favourite Technic set would probably be asking for the impossible, but could you narrow it down to maybe 5 or so? Eric: You're right, that is a very difficult request! Since I have so many, I tend to favor sets which are unusual or special in some way. I love all of the Auto Chassis sets although 8880 is my favorite. 8480 is near the top of the list because of its tremendous functions, beautiful looks, and unique subject. Both Control Centers (8094 and 8485) are incredibly clever and unusual as is the 8479 Barcode Multi Set. I can't neglect the 8868 Airtech Claw Rig with its pneumatic compressor. All 3 of the big F1 cars (8458, 8461, 8674) are magnificent and have incredible tires. Among the newer sets, I really like the 8421 Mobile Crane and the 8265 Wheel Loader. That's more than 5 isn't it? Jetro: What mechanism would you like to see in an official LEGO set? Eric: The dual functions passing through a turntable I mentioned above is something which AFOLs had used for several years and many people were waiting for in an official set. Now that it has been done, another long time request is an electrically operated pneumatic valve. Jetro: In one word, Liftarm or Technic Brick? Eric: Technic Brick is two words. I like them both and both have their optimum uses. Liftarms are better for trusses and linkages, bricks are better for rigid structure and chassis. I hope the old bricks never go away completely. Jetro: What is the secret to your fabulous renders? Eric: I've only been rendering for 1.5 years. There's no secret that I could describe in this space except that it is all about lighting. Just a few years ago, it was quite complicated to get a model converted from LDraw to POV-Ray. These days, if you have Travis Cobbs' LDView and Lutz Uhlmann's LGEO library (both of which are free), getting a very good quality render is trivially simple. Just export from LDView and the result is very, very good. I take it a few steps farther by changing the part color definition, replacing the default point lights with area lights, and using a high dynamic range light probe with radiosity. You can read about most of that in Koyan's excellent tutorial on Brickshelf. Occasionally I do even more and add trees, mountains, clouds, etc. I spent a lot of time experimenting with different types of and numbers of lights to get what I thought was an optimum result. One little secret I'll reveal is that there is virtually no such thing as white light. By default, POV-Ray uses white lights, but in the real world virtually no light source produces every part of the visible light spectrum. I always reduce the blue on my lights by 10% to give a slightly yellow tint which seems much more natural. Jetro: In November 2009 you and two other AFOLs (Fernando “Conchas” Correia and Paul “Sariel” Kmiec) started participating in the LEGO Technic Blog. So far, what do you think of the experience? Have you received any feedback? Eric: That was a big surprise to me and has been a very positive experience. LEGO is one of the best companies in the world at community outreach, and Monica with the Technic team has been truly inspiring with which to collaborate. It is exciting to be able to reach the audience that the Technic site allows, and it is humbling to realize that a large company like LEGO is willing to let non-employees contribute in such a public way. I even got a Christmas card from the whole LEGO Technic team! You can read the rest of the interview (and much, much more!! ) 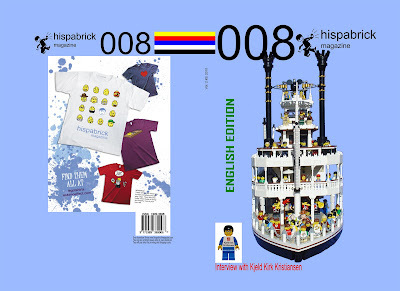 in Hispabrick Magazine 008.